You are here: Home > What’s a Tracking Device? 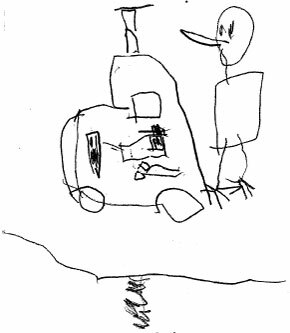 Ian drew this picture in the car last night, coming home from dinner. He explained his idea—in exhaustive detail—on the way to the restaurant. Be sure to click through and hover to read the notes. He was very specific in his design. I’m guessing like a GPS device, or “sat nav” as they’re called here. Smart kid… thinking ahead in case he gets lost!